Tracking indoor locations of residents is a prerequisite of accurate monitoring and advanced understanding of human activities in smart homes. Without using any indoor video surveillance devices in terms of preserving privacy and security, majority of existing approaches often utilise wearable BLE/RFID sensor tags to track locations of residents through analysing variations of received signal strength and angle of sensor tags. In a multi-residential environment, these tags can also be used as unique identifiers to help distinguish individuals. However, the extra burdens of remembering and wearing sensor tags all day along restrict them to be widely accepted by senior communities, let alone by people with neurodegenerative diseases. 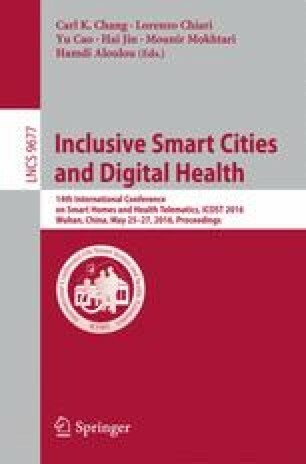 In this study, we propose a novel indoor tracking technique for smart homes with multiple residents, through relying only on non-wearable, environmentally deployed sensors such as passive infrared motion sensors. We design a multi-tracker system that uses multiple, independent probabilistic models, such as Naive Bayes and hidden Markov model, to track different residents’ movements separately. We evaluate our tracking technique on real sensor data acquired from a dual-occupancy smart home in our clinical trials. The experiment results, through comparing with location details acquired by wearable tags, demonstrate that our proposed technique is a simple yet feasible solution to tracking multi-residents’ indoor movements.